So in this next part, what we're going to do is take a look at some techniques for figuring out what theme function or template file is responsible for the output on the page. It's really hard to track down without a couple simple tools. So the first one I wanted to show you was called "Theme developer" and this is at "Drupal dot org slash project slash devel underscore themer". And what this module does is overlay a nice user interface on top of the page and allows us to click on various elements of the page to discover what theme preprocessing functions, template files and theme functions have led up to that particular output. One thing to note here is that this is in development version right now, which means that there are some bugs and so there's a couple things that you won't be able to do through it but it's still an invaluable tool, for just the basic point of finding out whose responsible for the output. Ok. I'm going to go ahead and jump back to my Drupal site and I'm going to look for "Theme developer" on the page. Ok, here it is under the "DEVELOPMENT" section. Go ahead and enable it and scroll down to the bottom and click "Save configuration". Now what this has done is added this little box in the left hand bottom corner that says "Themer info". And if we click that, it will display a box up to the right that says "Click on any element to see information about the Drupal theme function or template that created it". And that's exactly what it does. As we hover over various items, it creates a box around anything that was output through a template file or theme function. And if we click it, it will display some important information up here. So let's go ahead and take a look at what it shows us. The first thing to look at is this "Function called:" bit right here. And this tells us what function was responsible for the this output and its "theme_status_messages". We can also see what called this theme. 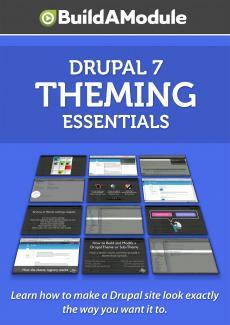 How to build or modify a theme in Drupal 7. We discuss various methods to modify Drupal output, how to decide which to use, and work through several practical applications of useful techniques.In this collection, we walk you through a variety of methods to get your site looking exactly the way you want it to in Drupal 7. Because there's so many ways to adjust the output of your content in Drupal, it's sometimes difficult to figure out which techniques are the best for each situation. By the end of these videos, you'll have a firm handle on the most common tools and methods used for modifying output in Drupal, and which to use each of them. How to build a theme from scratch - Once you know how easy this is, you'll be able to figure out exactly what you're getting by using pre-made themes like Zen and Omega. How to build a sub-theme - Most of the time, you'll use an existing base theme and extend it so you can leverage the work done by themers who have already wrapped their minds around the big challenges with theming. How to track down the source of any output in Drupal - Before you can adjust the HTML output of your page, you have to figure out where it comes from. This can be tricky in Drupal, but in this video we describe the tools you need to get to the bottom of anything you can see on your site. How to work with view modes - View modes provide a way to toggle the display of content for different situations, like a teaser view for a list, but a full content view for the main content page. Here we describe how to work with them. How to extend theme settings - Theme settings provide a way for the end user to adjust the basic look and feel of a theme, like colors and a logo. In this collection, we show you how to add new settings for your end users. A basic understanding of PHP - Theming involves getting into code a bit. There's nothing too advanced, but if you're new to PHP, consider watching the "PHP Programming Basics" collection first. If you want to figure out the best way to adjust Drupal's output so that the changes you want to make are as sustainable as possible, these videos are for you. If you have some experience with theming already, this can be a great way to validate what you already know and fill in the gaps. If you're totally new to theming, then, you'll make some huge leaps in understanding by working through this collection. 7:18What is the difference between designing, theming and coding, and why do they overlap so much? 10:40What are all of the different ways to modify Drupal output? 4:20Before you start, is there a simpler way?